B&W ASW608 review | What Hi-Fi? The ASW608 is a fine choice of subwoofer if you're really pushed for space. This seriously compact B&W measures a bijou 26 x 26 x 33cm. Unsurprisingly, considering its provenance, this is also a rather natty-looking design, and it comes complete with lots of tweaking potential. We looked at this tiny troublemaker's bigger brother, the ASW610XP and for £700, that bass box offers something rather different – but undeniably impressive. Can this sub make a similarly strong impression? There are also two EQ settings – usually nominally for music and movies – and low-pass filter frequency settings. Dinky this box may be, but there's still a 200-Watt amplifier inside this forward-firing, solidly made, sealed cabinet. It's not unheard of for comparatively small boxes to pump out fairly large amounts of bass, but producing really low bass notes usually requires a large driver to move large amounts of air. So we're interested to see how the '608 fares. Sure enough, the relatively small driver does fall a little short compared with others when it comes to digging really deep. Underworld: Rise of the Lycans provides plenty of opportunities for the sub to stretch its muscles, and the ASW608 turns in a fast, lively and punchy delivery. 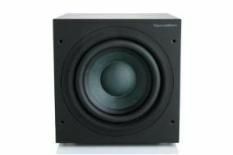 There are undoubtedly shortcomings where deep basslines are concerned, but if it's a compact, solidly built box that you're after, this remains a fine option.